Last Saturday morning I was racing around in the woods of the Tusquitee Ranger District on the other side of Murphy, surveying some of the outlaying bird points, trying to finish up that district. I don’t know why it is but every district I survey has a few of those points. Count protocol calls for ending each day by 10 a.m. As the day heats up the birds quiet down – not singing as much. Most of the points are in groupings – there will be four or five along a route then a few miles away will be another cluster of four or five. When they are grouped like this it is pretty easy to get eight or 10 points in a morning. But then there are the outlayers. Points, sometimes just one, but usually two, maybe three, set out miles away from any other points and often hard to access, along abandoned or rarely used roads. I had five points left to wrap up Tusquitee. I got an early start and was at my first point at 6:45 a.m. Surveyors spend 10 minutes at each point. So, doing the math – five points; 10 minutes at each point – that’s only 50 minutes of actually surveying and I’ve got nearly three hours – I’m thinking this should be a pretty easy morning. But when you start adding up all the incidentals – opening and closing Forest Service gates, which means removing the wasp nest(s) first – then it’s six miles as the crow flies – at least a 20 minute drive – between the first two points and the third and another three miles between the third point and the last two – by the time I arrived at my last point it was 9:55 a.m.
Thankfully it was overcast and only 57 degrees Fahrenheit as I approached that last point. And the birds were singing. In fact the birds were singing and chipping and chattering. They were about as raucous as birds can get. Survey protocol asks you to estimate the distance the birds are from the physical point. You are to estimate what species are within 25 meters of the point, what species are between 25 and 50 meters from the point and what species are greater than 50 meters from the point. You are also asked to designate what birds you hear during the first three minutes of the survey; what birds you hear from minutes four through six and what birds from minutes seven through 10. It was easy enough, right away to tell some of the species within 25 meters of that last point. When I arrived there were at least eight or nine birds, representing three species, all within 50 feet of the point. 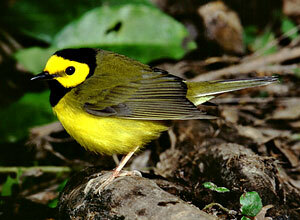 There were three, male hooded warblers singing away. There was a pair of indigo buntings. The male was singing a part of his song, plus chipping (indigos have a loud, sharp chip note) and scolding. The female was also chipping and scolding away. I assume there was a nest nearby. If that wasn’t enough commotion, there was also a mamma pine warbler with fledglings. She was chipping and scolding me while the babies were all clamoring for a mid-morning snack. The noise was intense. It was like being at the symphony and having somebody in the next row blasting Snoop Dogg from a boom box. I actually had to change seats – moving 25 meters or so from the point – so I could hear the rest of the symphony. Some of the other performers included black-throated green warbler, Kentucky warbler, ovenbird, pileated woodpecker, red-bellied woodpecker, mourning dove and Carolina wren.